The No. 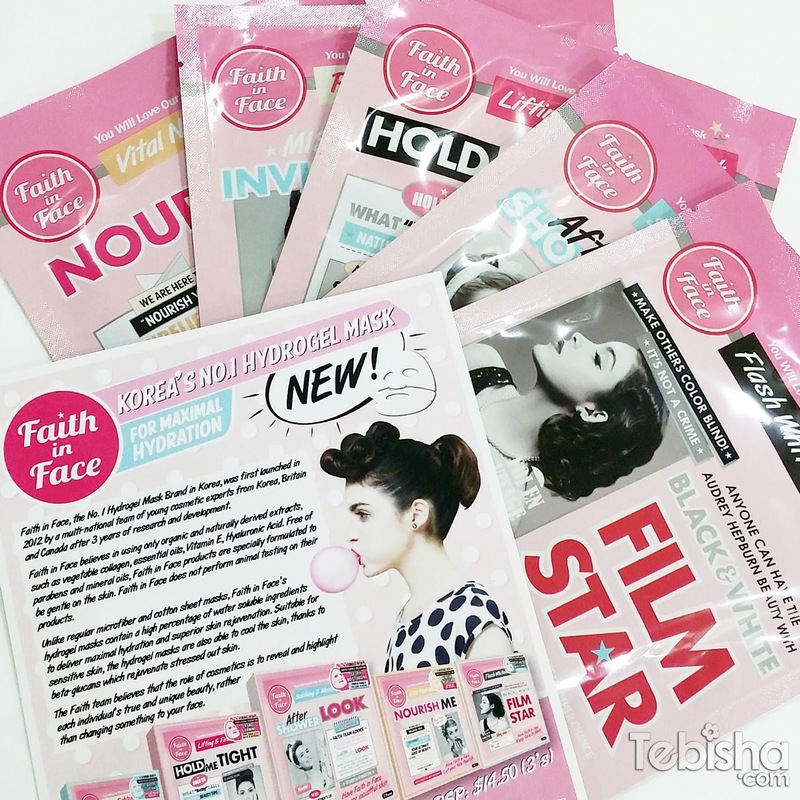 1 Hydrogel Mask Brand in Korea, Faith in Face is now here in Singapore! With the faith that everyone is born with an attractive and beautiful face, the Faith team strongly believes in original beauty and goes by their motto of “Have Faith in Face, Origin of Beauty”. The Faith team believes that the role of cosmetics is to reveal and highlight each individual’s true and unique beauty, rather than changing something to your face. reactions. Faith in Face does not perform animal testing on their products. Unlike regular microfiber and cotton sheet masks, Faith in Face’s hydrogel masks contain a high percentage of water soluble ingredients to deliver maximal hydration and superior skin rejuvenation. With a gentle formula that is suitable for sensitive skin, the hydrogel masks are also able to cool the skin, thanks to beta-glucans which rejuvenate stressed out skin. Reviews: By looking at the packaging it has actually attracted me to purchase it. After trying it, it gave me another WOW effect! 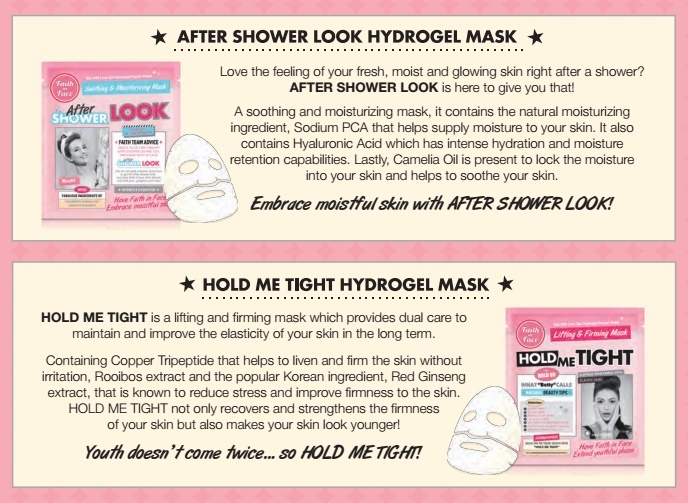 Hydrogel mask is so much convenient and easy to use type of mask. It’s non-messy, don’t have to worry about the essence of the mask dripping while putting on. The hydrogel mask is separated into the upper face and lower face, very easy to put on. Can conveniently adjust to your face shape and allows the mask to be nicely fitted. It calms sensitive and irritated skin, very gentle to skin. Due to the breakout on my skin recently, I used After Shower Look Mask to sooth and hydrates my combination skin. Remove the mask after 30 mins, immediate radiance and moisturise the skin effectively. 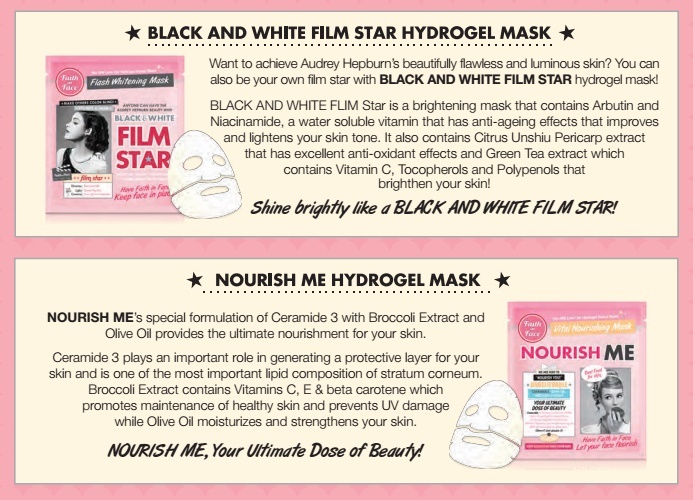 5 different types of Hydrogel Mask available! So far I have tried, After Shower Look and Nourish Me, I love both! Choose the type of mask depends on your skin needs and mood, change it weekly to see the different effects!